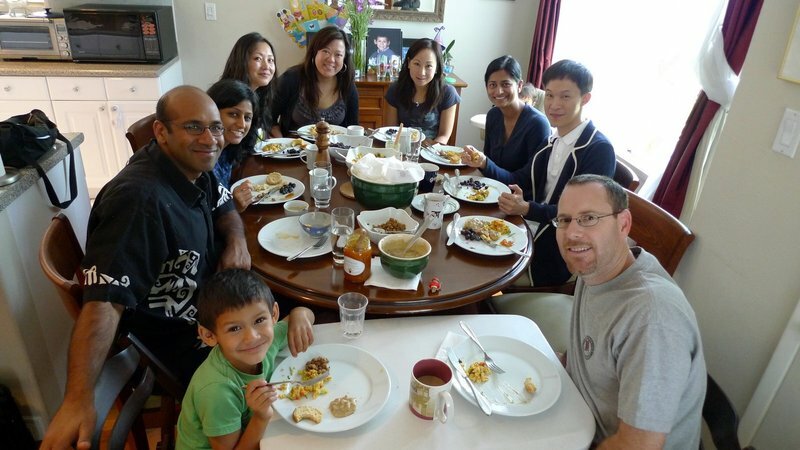 Sunday morning (last Sunday, a week ago), Tawn and I concluded our visit with high school friends, enjoying a tasty brunch in the home of Aaron, Lalima, and their family. A simple meal of Indian style scrambled eggs, chicken sausage and gravy, and buttermilk biscuits. We really enjoyed the opportunity to visit our friends and appreciate that three of them made the flight down from the Bay Area so we could spend this time together. In the afternoon, we headed to Venice Beach and met Gary and W for a spot of tea at Jin Patisserie. This cute place is on Abbot Kinney Boulevard and is a regular stop for us when we’re in Los Angeles. We also made a brief stop at Three Square Bakery, located across the street from Jin, to pick up some pretzels and whole grain bread. The cake of the day was, if I recall correctly, a sponge cake with mango mousse and strawberries. Or something like that. Clearly, I should have taken notes. Gary had a chocolate cake that was very pretty. I didn’t try it, though. He didn’t leave any crumbs, though, so it must have been tasty! As Sunday came to an end the first “vacation” portion of my trip came to an end, too, as I returned to work all day Monday and Tuesday and the first half of Wednesday. My manager and another colleague flew into town for meetings with me, and then my manager’s manager and her manager came into town, too, resulting in an impromptu multi-level meeting. While I generally would not want to interrupt vacation with work, I enjoy my job and am close to my colleagues so it was nice to be able to see them and have the sort of strategic meetings that are difficult to do via teleconference. There is an Indian style of eggs? I never knew… what is it? 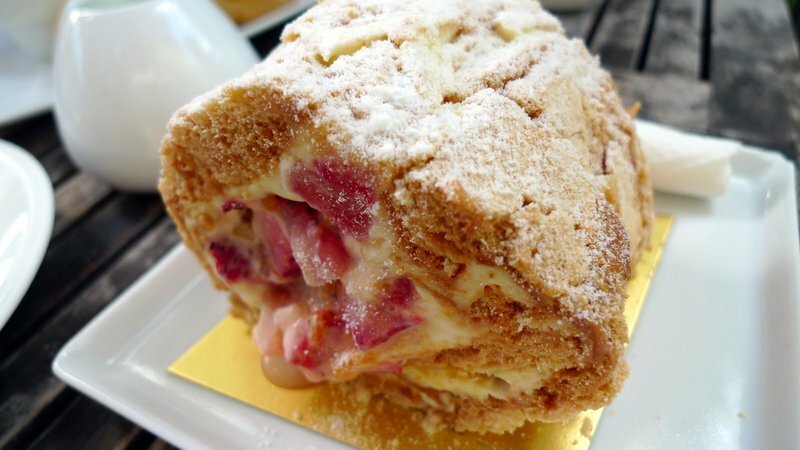 Sponge cake with mango mousse and strawberries. Please tell me you thought of me. 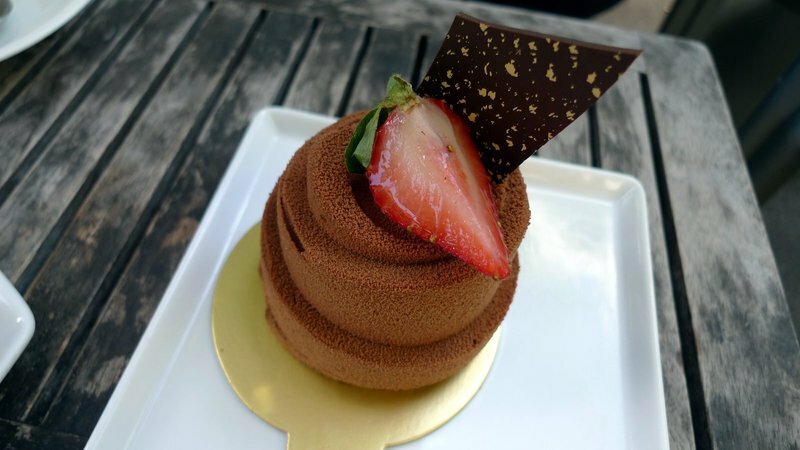 AH, you make me hungry all the time – love strawberries – mangos and chocolate lol. @Dezinerdreams – hahahaha…. now I won’t feel silly asking what that is. I can see why that place is a favorite for you and Tawn. I’m glad you’re able to find a way to balance your work and vacation. It really helps if you enjoy your job and your colleagues (I’m sure that goes without saying). It’s getting tougher in a lot of corporations to juggle workload. Thanks too for posting regularly while you’re on vacation! Such pretty food! In the 2nd picture Tawn looks like he knows a secret and he’s not telling! hehe! @Dezinerdreams – @ElusiveWords – Using the term loosely to describe eggs cooked with fried onions, tomatoes, and turmeric. The friend whose house we were at is from Bangladesh and she calls them “Bengali style scrambled eggs” so I guess it isn’t a fixed term! @The_Eyes_Of_A_Painter – Catchy title! @CurryPuffy – I’m going to start a series of photos of you taking pictures of food. @kenpcho – It was great seeing you. @murisopsis – Unfortunately, I can’t tell you. Well, I could, but I’m not allowed to… LOL@rudyhou – It was a scrumptious as it looked. @ElusiveWords – Well, if I don’t keep posting regularly while on vacation, then I wind up with a backlog of several weeks! @ZSA_MD – While at a lovely place drinking tea and eating something with mango in it? Of COURSE we thought of you! @mizz_chan – We are (or were, since vacation is now over). Thanks! @Fatcat723 – My plan is working… make everyone hungry! @yang1815 – Really, that’s about as much as needs to be said about it.